France, 1967, 68 minutes, Colour. 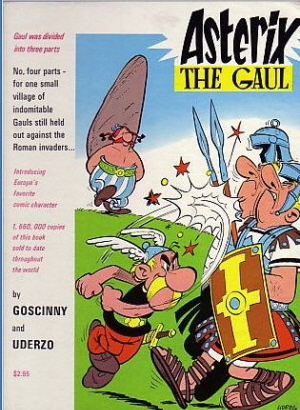 The plot concerns a village in Gaul which is attacked by the Romans. The Gauls are able to resist the invaders by a potion, from the Druids. However, the Roman general wants to capture the potion in order to defeat the Gauls. While the film echoes actual history, the focus is on the rather folksy stances, attitudes and dialogue of the famous Gauls. Other films include The Adventures of Asterix and, in the late 1990s, Gerard Depardieu and Monica Belucci and others starred in a live action version on Asterix and Cleopatra (Depardieu was Obelix). 1. The appeal of this cartoon? Its style of animation? 2. Audience interest in and response to Rome, Gaul, Caesar? The small against the greater? The success of the underdogs? Themes of power and success? 3. The detailed attention to the village: its look, style of life, the people, attitude to the Romans, their victories, reliance on the potion? 4. Asterix as hero? A comic but respected hero? His heroics? The comic hero in Obelix? The wizard and Panoramix, and his mixing of the potion? 5. The presentation of the Romans, of Balonus, the Romans ridiculing of the spy, Balonus and his ambitions? The detailed presentation of the cowardly soldiers, their brutality, their fear, their bashing of the spy? 6. The presentation of the spy, his getting the potion, participating in the Gaul’s' way of life, the dancing, his being discovered? 7. The capture of Panoramix and his torture, Asterix going to help him, the tricks that the two played on the Romans? 8. The satire in the Romans, greediness for the potion, the gathering of the herbs and the exhausting of the guards, the growing of the beards and the hair? 9. The retribution of Caesar? 10. The happy ending for the Gauls? 11. The value of this kind of animated film, the quality of its humour, its values?